Happy Fourth of July to all you Americans out there! 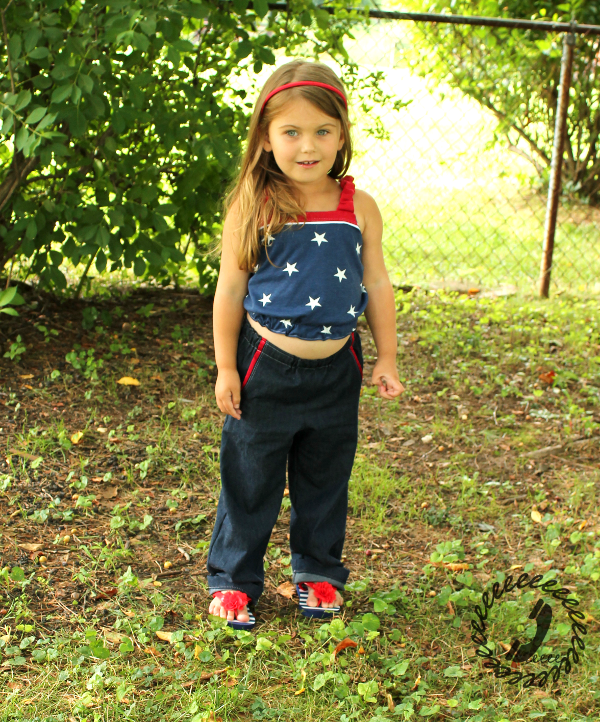 Today’s Paneled Sunsuit focus is on the Trousers (view G in the pattern). These loose-fitting pants are the bottom half of the jumpsuit so they are designed to sit a bit high-waisted. 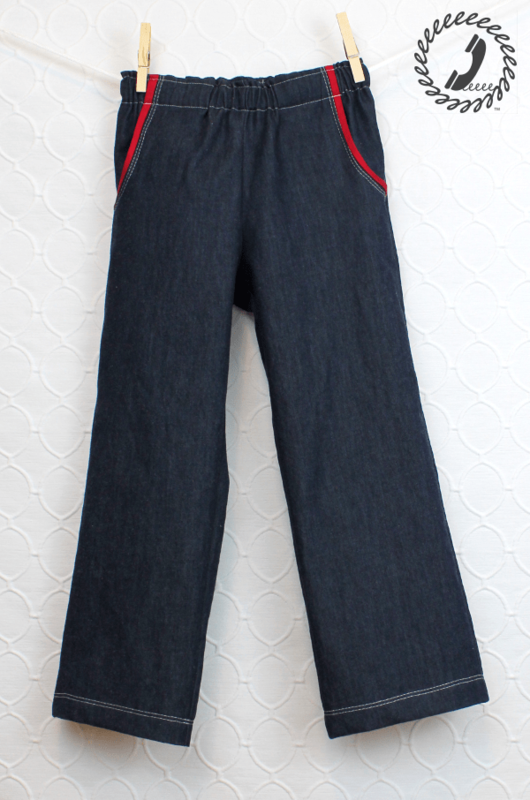 There are options for no pockets, regular pockets, and pockets with a faux piping like the pops of red in these pair. These are made with a light-weight denim from JoAnn Fabrics, but they are designed to work with a variety of wovens and even a hefty knit like a ponte de roma as well. They look super cute paired with a cropped tank (view E in the pattern). There’s something very 90’s hip hop about these trousers that I love. They’re just baggy enough to be comfortable, but tailored so they don’t look sloppy. 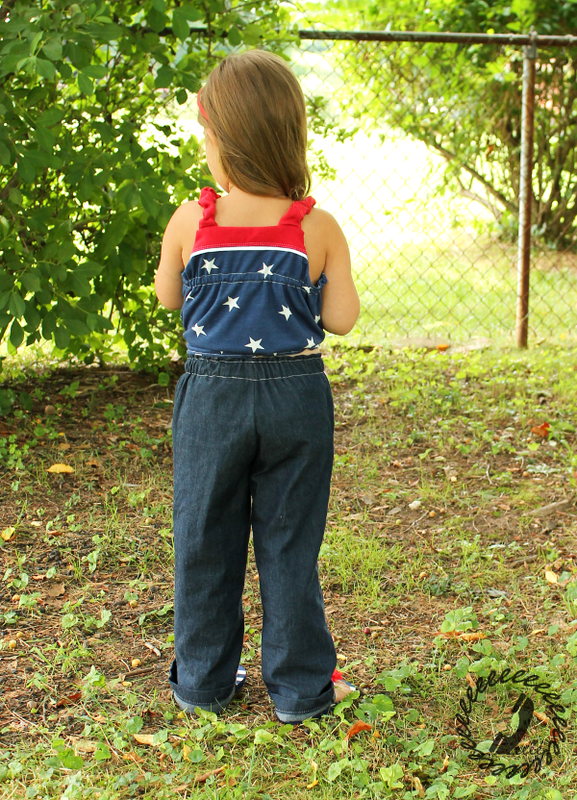 I made these pair in size 5 which Bean just moved up into so the length is a bit long on her four year old legs. They’ll fit great come autumn when we’re back to wearing pants, which is all part of my master sneaking-in-some-back-to-school-sewing plan, hehe. 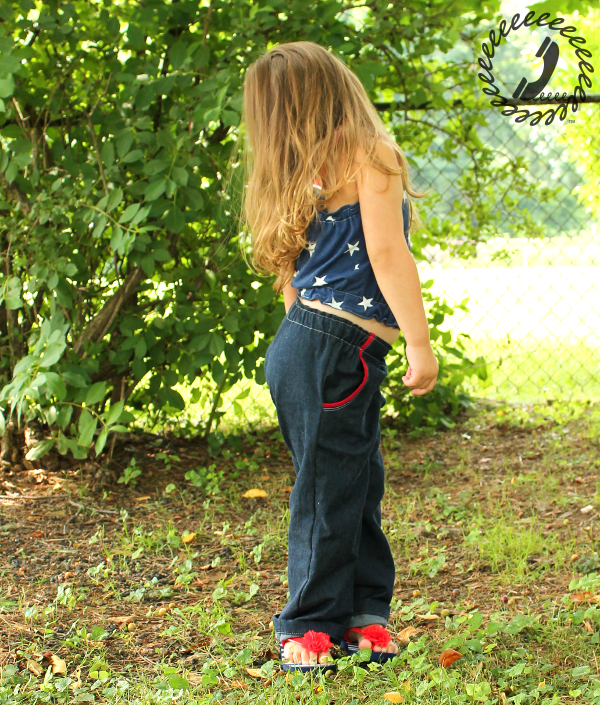 She wore these to a big 4th of July party last night and danced the night away. I was actually impressed that they stayed up on her waist with all of her crazy dance moves without her having to pull up the back every few minutes like she does with a lot of her pants. She has a bit of a booty so the extra rise in the back of the trousers is always welcome.